WordPress, quite the auspicious platform, has grown in development and popularity over the last decade. What was once a run of the mill blogging script is today a fully fledged content management system (CMS) you can use to create any website imaginable. Now, WordPress is a darling of millions of website owners since it’s simple to learn and use. Creating a website is a matter of finding a great host, the perfect WordPress theme, and a couple of plugins. So far, WordPress has created a humongous market for theme and plugin developers as well as a specialized group of web hosts known as managed WordPress hosts. Tom Ewer already guided us through finding the best WordPress host, so we won’t go into that today. In the same fashion, we won’t look at the essential WordPress plugins you need as you launch your website. No, we shall reserve that for another day. Today though, we are covering 20 of the best free WordPress themes out there. Any of these themes will come in handy if you’re building or rebuilding a website. We’ve done our very best to gather the most beautiful in terms of design and the richest in terms of features. If you know of a free WordPress theme you’d like featured on this list, please share in the comments at the end. Other than that, prepare to rumble. Enjoy! Which Free WordPress Theme is Best? 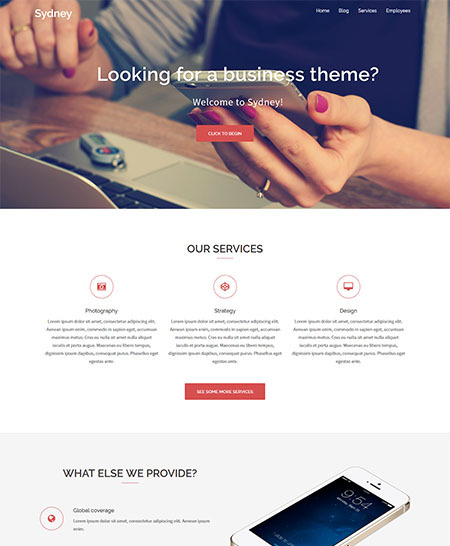 Meridian One is a stylish one-page business theme that’s easy to make your own thanks to its intelligent use of the WordPress Customizer. It features a smooth-scrolling one-page design with a sticky header that allows visitors to gracefully slide to whatever section catches their eye. One of the unique things about Meridian One is how it’s entirely powered by the WordPress Customizer. This makes the theme very easy to customize, even if you don’t know anything about code. You can edit or enable/disable every section on your homepage right from the real-time Customizer. And you can also view a live preview of every single change right as you make it. Beyond that, Meridian One has all the necessary sections any business needs. I’m talking about features, services, testimonials, team members, contact forms, Google Maps, and more. In total, you get 11 different homepage sections. Plus, even though it’s a one-page theme, you still get a stylish blog page to share the latest news. Lightly is a free responsive theme by FancyThemes. 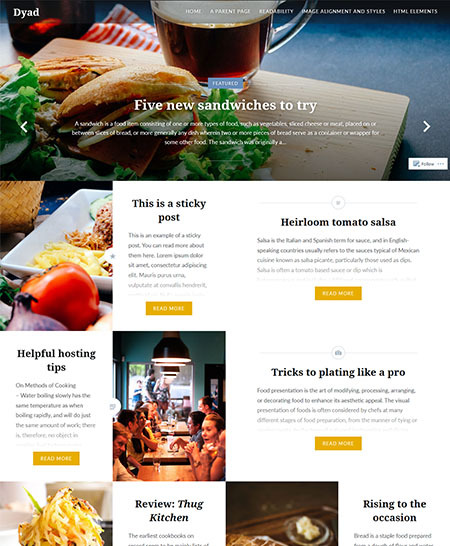 It’s a visually stimulating, stylish yet simple blog theme that will add ease to WordPress site development. Keep your content at the forefront with the minimalist layout, and reach your readers across multiple devices thanks to a fully responsive grid. Lightly is optimized for speed. I tested it with GTMetrix and recorded a PageSpeed score of 88%. That’s a cool B for brilliantly fast. The theme recorded a page load time of 1.4s with 40 server requests. That aside, this free WordPress theme is easy to customize with your own logos and colors. On top of that, you get a fancy slider, widgetized homepage, full localization support, and regular updates among other things. 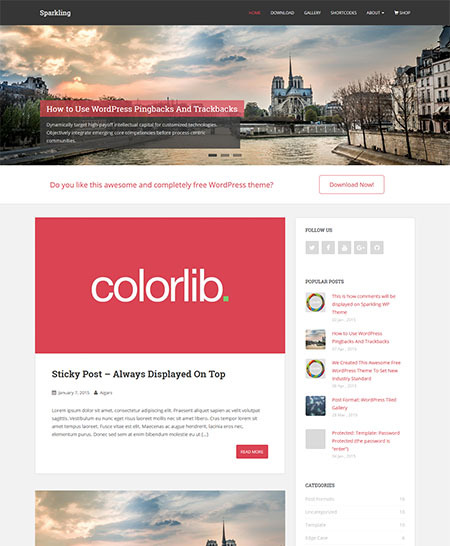 One of the best rated and most popular free theme at WordPress.org, Activello by Colorlib is a minimal WordPress theme perfect for bloggers, designers, and other professionals in the creative fields. Yes that includes you. The design is pretty simple and straightforward, which keeps distractions at bay. Activello supports WooCommerce, meaning you can build an eStore on your site in no time. Further, this free WordPress theme comes with plenty of customization options that let you build a website out of your dreams. Activello is SEO-friendly and fully responsive, meaning you won’t break a sweat to get the best rankings in Google. It also means your visitors will have a pleasant experience whether they are on a desktop or smartphone. Other features include infinite scroll, WPML support, featured sliders, Font Awesome icons, unlimited colors, theme documentation, and awesome support among others. Palmas is a simple, minimalist and elegant theme brought to us by Dev Sharma of WPKube. He’s quite the nice guy, and you can see his character imprinted all over this one of a kind theme. The layout is clean letting you concentrate on what matters; your content. 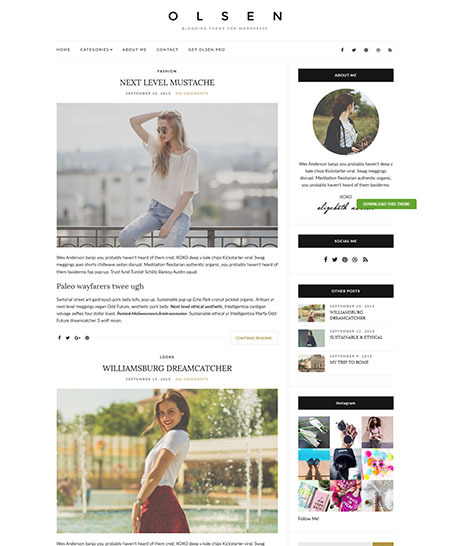 It’s the perfect theme for bloggers, writers, poets, travelers, photographers, creative agencies, and much more. It features a great head mast, and an awesome sidebar with a couple of widget areas for all your related posts, archives, social buttons, and more. 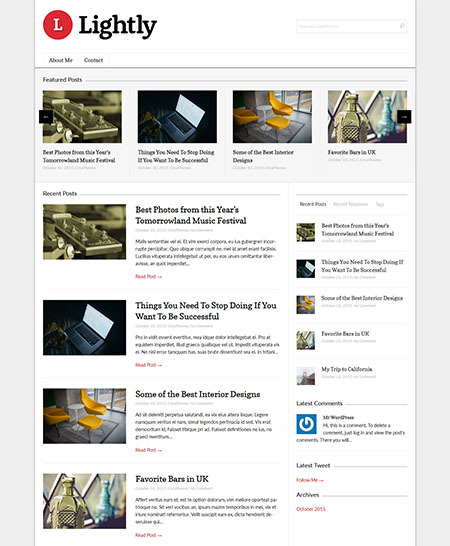 If features a beautiful and interactive post slider at the top, a popular articles section and a really cool post grid. 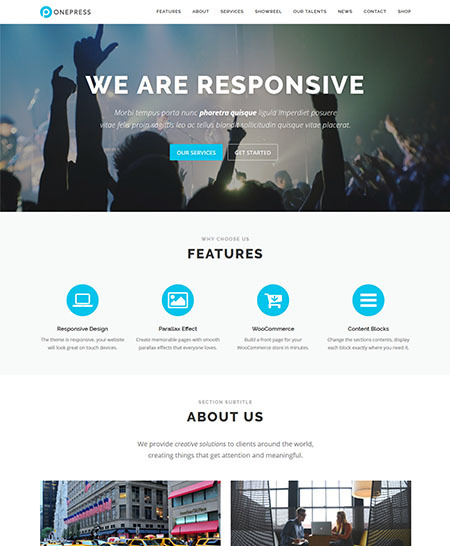 As you’d expect, this free WordPress theme is 100% responsive. The single post template is awesome and comes with typical features that make blogging fun such as author bio, related posts section, and a nice comment box. You can add extra menus and even a call to action button in the footer section. Simply put, Palmas is for the colorful creative who appreciates plenty of white space. That’s probably everybody I know. Heck, it’s probably everybody you know. I know, I know…you probably think I’m insane to include Twenty sixteen on this list but you’d be surprised the things you can pull off with this theme. For starters, this theme is built on mobile-first approach and thus looks amazing on screens of all sizes. With a couple of color schemes, widget areas and many customization options that you can easily adjust via the Live Customizer, Twenty sixteen offers you a solid foundation to build any type of blog or website. And since this baby was baked right at WordPress, you can expect only the best web standards, regular updates, and amazing support. WordPress 4.5 “Coleman” lets you see how your site looks across multiple devices, and Twenty Sixteen is quite the beauty – adapting beautifully to various screen sizes, but we’ve sort of said this already. What we haven’t mentioned is you can now add your own custom logo to the default WordPress theme (Twenty Sixteen in our case) as opposed to previous versions of WordPress. In other words, you can customize Twenty Sixteen to look exactly how you want, just by clicking a few buttons here and there. Averaging about 600 downloads per every other day, Sauron is a relatively new and intriguing multipurpose theme by Web-dorado. 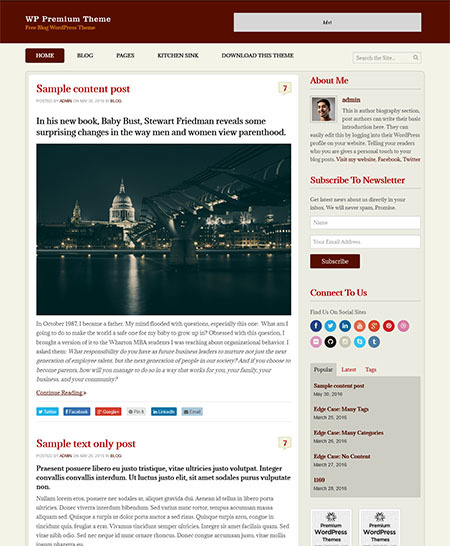 For a free WordPress theme, Sauron delivers quite a punch in terms of features. The title Sauron must conjure memories of Lord of Rings, but stay with me for a minute. You can expect easy to customize features such as a front page builder, layout editor, full-width posts grid, social sharing and fullscreen lightbox slideshows. This SEO-friendly theme uses parallax technology, one page scroll and sticky menus to create a wonderful experience for your readers. On top of that, Sauron is compatible with the best of WordPress plugins such as Jetpack, bbPress, Photo Gallery, WPML, Contact Form 7, BuddyPress, and a couple of eCommerce plugins. Sauron is 100% responsive, retina-ready, and flat in design. It’s the theme you depend on when building corporate, commercial, portfolio, blog, photography, health, and other websites. Built to offer the best of user experience, Good helps you to showcase your works in style. Whether you’re a photographer, graphic designer, sketcher or any other professional in the creative industry, you’ll love the portfolio capabilities of Good. Easily add your logo and favicon to brand your business with a single click. Further, you can use the Live Theme Customizer to edit every detail of your theme. On top of that, you get unlimited sidebar menus, a retina-ready and responsive design, high performance, exceptional typography, continual updates and fully localization support among others. 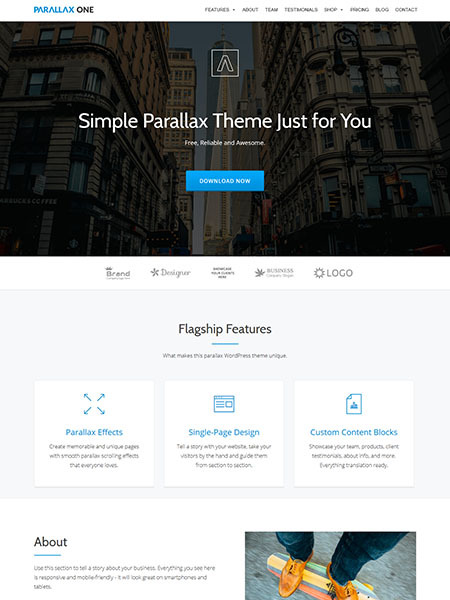 ThemeIsle’s Parallax One is one of the absolute best, modern-esque responsive themes for WordPress sites that are in line with the latest web design trends. This not only provides your viewership an optimal browsing experience but ensures that your site looks stunning on devices with different screen sizes. The theme is built on top of a solid coding foundation with a clean, validated code. Its theme options panel enables webmasters to modify their site’s appearance without having to code. The standout feature with Parallax One is, of course, its smooth-scrolling parallax effect that presents dynamically loading images with subtle animations based on lightweight technologies. The crafty one page design is incredibly lightweight giving you blazing fast page load times. Google Maps integration for a simple navigation guide. Education is an industry with an estimated worth of $1.3 trillion dollars. That’s a lot of gravy is you ask me. But that’s not the best part. The best part is you can get in on all the action with your own educational website. But it’s expensive and complicated to set up an educational website, let alone selling courses. You might argue. Nah it’s not, especially with a free and feature-rich theme such as Education Hub by WEN Themes. 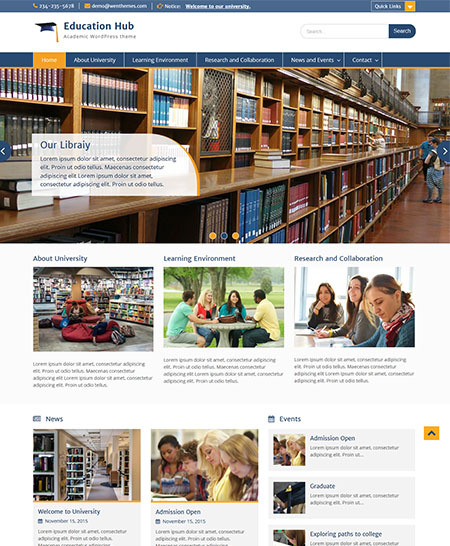 Education Hub is a clean and modern WordPress theme that’s perfect for online courses, colleges, universities and other educational institutions. Thanks to the host of features the theme comes with, you can further customize Education Hub to suit your other needs be it personal or commercial. In other words, this theme is multipurpose. Education Hub ships with features such as highly customizable layouts, advanced theme options, a responsive design, custom CSS, featured sliders, custom widgets, and custom header images among others. Education Hub Pro ships with more features. Obviously. A friend is using this theme to run his plugin review site. Before he went live though, he asked yours truly to give the theme a once over. I obliged because he’s a great friend and because Hueman looked promising from the word go. Well, I was surprised when I gave the theme a test run, such that now it’s part of my professional toolkit. Hueman is more than just promising. 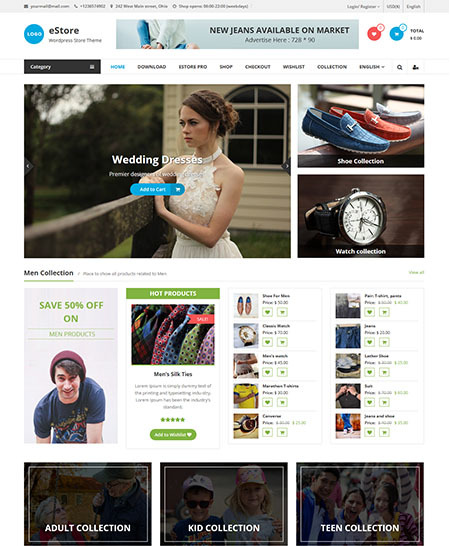 It’s an incredible free WordPress theme used by more than 70k active websites across the globe. Whoa. Hueman has an impressive rating of 4.9/5.0 with users raving all about the theme. 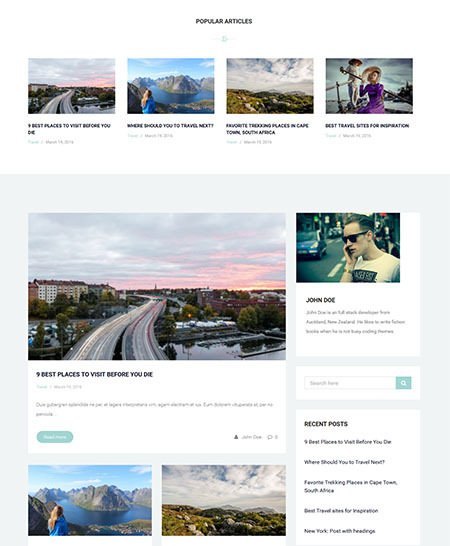 This free WordPress theme comes with some notable features such as flexible layout options, multiple widget areas, extensive styling options, toggle sidebars, Font Awesome icons, share buttons, shortcodes, footer and header ads, featured slider/story et cetera et cetera. You don’t have to struggle to sell your physical products or digital downloads, what with eStore, a free WordPress theme built specifically for the WooCommerce platform. Organizing your ecommerce store with eStore is easy as pie thanks to a unique set of custom widgets and premium features you’d hardly get with another theme of this caliber. eStore by ThemeGrill ships with other features such as a responsive design, 728 x 90 header ad, multi-color categories, multiple sidebars and four footer widgets, AJAX technology, and custom CSS among others. The theme has an average rating of 5.0/5.0 with over 7k active installs. Are you looking forward to launching an online magazine? Perhaps you already run one and are looking to rebrand. 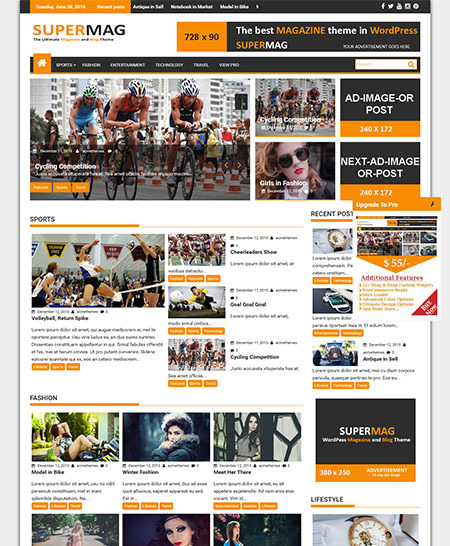 Well, rest easy, we present you the SuperMag free WordPress theme from the capable guys at Acme Themes. This bad boy is powerful from the inside out, giving you the tools and the layouts you need to create a professional magazine site in a matter of minutes, not months. I mean, just look at the screenshot above. If you can’t make out which section is which, allow us to lend a hand. We have an intricate news ticker at the very top, a nice customizable menu just below the logo, an intuitive slider, featured content boxes next to it, ad areas to the further right, and so much more packed in a single theme that’s fully responsive to the core. Other features include advanced widgets, breadcrumbs, unlimited colors, social media integration, Google fonts, and so much more. One look at Sparkling, and you’ll get the feeling Colorlib means business as far as WordPress theme development goes. With a crisp and clean look, you won’t have to clank away at your work station for hours on end to build a professional website that’ll get your content noticed. Sparkling free WordPress theme totes a couple of cool features including (but not limited to) impeccable flat design based on Bootstrap 3, responsive design, SEO-friendly code, awesome widgets, full screen slider, advanced theme options, infinite scroll, and amazing support. This theme plays well with most if not all free and premium plugins such as W3 Total Cache, Gravity Forms and Yoast SEO among others. To boot, this theme is so easy to customize you simply won’t stop creating awesome designs. The theme is simple and easy to use, customize and clean! Who would have thought a one pager would make this list? Well, if it’s really good, you will definitely see it here. 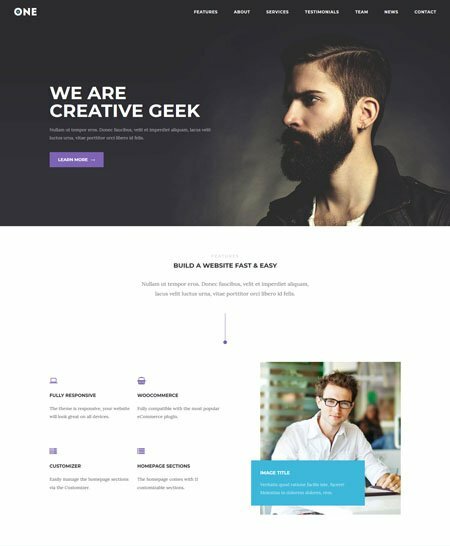 OnePress is an incredible, and creative one page WordPress theme suitable for freelancers, portfolio sites, digital agency and businesses in general. It offers you all the tools you need to create an outrageously sleek website in minutes. Thanks to a built-in theme customizer, you can change any details of your site at will, and without struggling. Just point and click. One pagers are known for their notorious usage of the parallax effect, but OnePress uses this technology to its advantage. They have perfected the parallax effect to create an unobtrusive and smooth experience that’s great across multiple devices because, again, the theme is fully responsive. Other features include compatibility with all modern browsers, SEO-ready code, full localization, amazing page speeds, HTML5, CSS3, and top notch support from FameThemes among others. The PRO version of OnePress comes with more goodies as it were. Joining the race at number 15 is none other than Sydney, a classical example (and reminder) of web design at its best. This pretty baby was crafted at aThemes, the same guys who have brought us many other thrillers in the past. Sydney brings plenty of customization possibilities like access to all Google Fonts, full color control, layout control, logo upload, full screen slider, header image, sticky navigation and much more. Couldn’t have said it any better. The theme also ships with smooth parallax backgrounds for that wow effect, front page blocks to create amazing homepages in your sleep, slider/image headers, social icons, translation files, responsive design and so much more. Most if not all times, all you need to win big with your readers is a simple design that’s easy to navigate. Really, a clean design brings out your content, allowing you to standout from the crowd. Such is Olsen Light, a top-of-the-range free WordPress theme by Anastis Sourgoutsidis, one of the fantastic heroes at CSSIgniter. 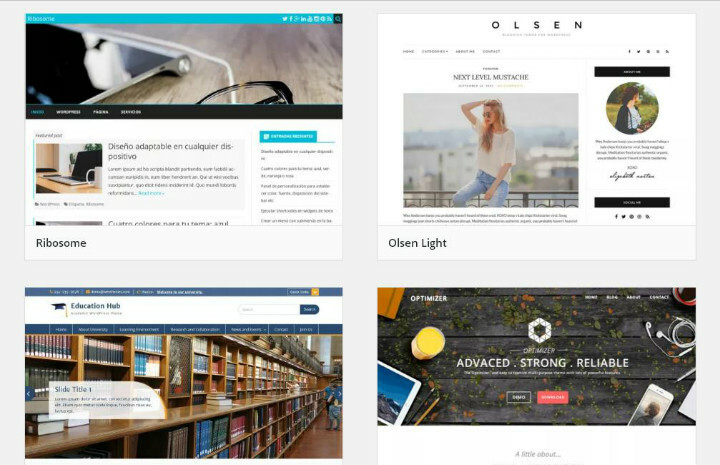 Released on the 28th of December, 2015, Olsen Light is a relatively new blogging theme that’s gaining quite the traction, what with over 8k active installs in less than three months. But what makes this theme the go-to choice for such an army? For starters, the clean responsive design ensures all your visitors will have an awesome time on any device they use. With more custom widgets than you’ll ever need, you can supercharge your site with content snippets, pop ups, social networking, Flickr widgets and more. I love me a good free theme. You know, the kind of theme that inspires you to do something great. A theme that challenges you to step outside the box, and perhaps get the creative juices flowing. Well, Emmet might not be all thaaat easy to customize especially if you’re a beginner, but once you get the hang of it, the design ideas you’ll get with this theme will bore holes through your skull. You’ll have numerous “light bulb” moments if you get my drift. Anyhow, how does this baby stack up in terms of features? It’s fully responsive for obvious reasons, and throws a front page customizer into the mix, so you can easily change all sections of the front page. You get a visual page builder, so you can drag and drop elements into place without breaking a sweat. Multiple blog layouts and unlimited colors are all at your disposal because, who gets enough of these elements anyway? 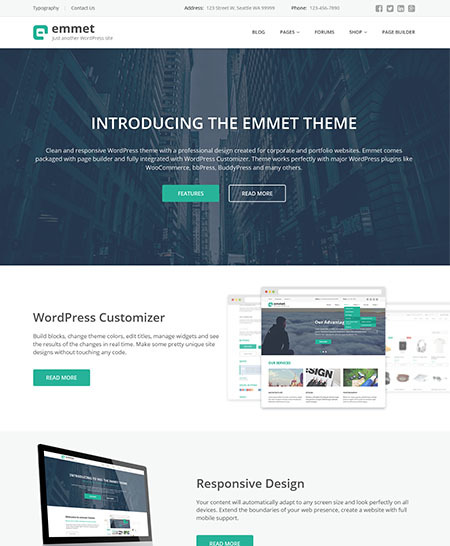 Emmet is fully compatible with BuddyPress, bbPress, and WooCommerce. It spots a great rating of 5.0/5.0 and 1k+ active installs. 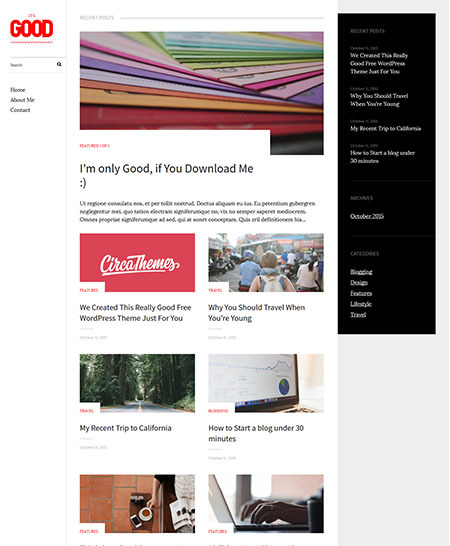 I have used this amazing theme on my blog for a couple of years now, and I cannot complain. It’s like having a premium theme, because on top of the many premium features, I have never had problems setting up and customizing the Elegant free WordPress theme by the glorious guys at WPExplorer. If you haven’t heard about WPExplorer, they are the experts behind the Total Multipurpose WordPress theme that’s doing quite well on Themeforest. Elegant is the perfect free theme for freelancers (just like yours truly), small businesses, developers (Hello there my friend), small businesses and so much more! The theme comes with built-in custom post types, so adding homepage features, portfolio and staff pages is a matter of point and click. Adding slides too is as easy as A, B, C.
Change logos, backgrounds, footer text, homepage selection, and so much more from the WordPress theme customizer. Additionally, the theme accepts custom CSS3 easily so there are no limits to what you can achieve. They have a premium version as well, so yeah, the fun never stops with these guys. 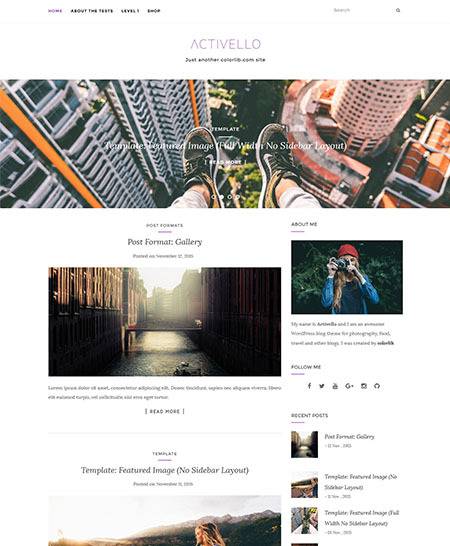 WP Premium by Templatic is the kind of WordPress theme that doesn’t try too hard to impress. Oh, and don’t let “premium” in the title throw you off, this theme is 100% free. Powered by the Foundation framework, WP Premium is built to withstand anything you throw at it, be it a corporate blog, a travel site, a personal journal or anything else you can imagine. For starters, the homepage uses content-first approach to make your posts pop. The homepage futher ships with extra widget areas for your pleasure. On top of these, you get even more widget areas in other areas of the theme! WP Premium is fully responsive and compatible with the best WordPress plugins such as WPML, SEO plugins and contact forms among others. Other features include share buttons, embedded videos, multiple page templates, custom CSS editor and much more. 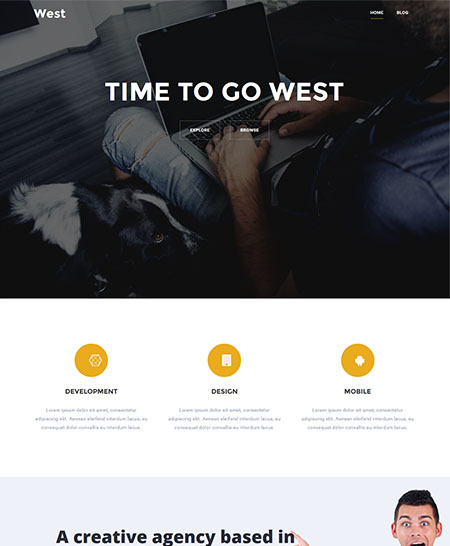 Time to go kids, and as a parting shot, I leave you with West, a state of the art and free WordPress theme that helps you to build a beautiful company site, portfolio, or a digital agency website without a hassle. Without wasting a second, let’s dive in and see what makes West different from all the others. Firstly, you get a host of premade layouts you can install with a single click. This saves you a whole lot of time. In the features department, West doesn’t disappoint either. You get header images, advanced theme options, Live Composer integration, HTML5/CSS3, responsive design, multi-lingual support and so much more. West has an average rating of 5.0/5.0 and over 4k active installs. We have to commend Automattic for a job well done here. Dyad, my friend, is the stuff of fairy tales, or sci-fi movies, and considering it’s free, you have a theme to die hard for. I had to Bruce-Willis-punch that term into the foregoing statement just to rhyme with Dyad. Ok, I will stop. This theme combines two elements effectively, which should perhaps explain the title Dyad. It couples images and text to create an engaging and visually appealing homepage as seen in the image above. Moving on swiftly, Dyad ships with some nifty features and layouts that point to astute design work on the part of Automattic. Dyad boast of awesome features such as customizable widget areas, features images, social media, and custom menus among others. Other features include infinite scroll, custom logos, sticky posts, unlimited colors, responsive design, and RTL language support among others. 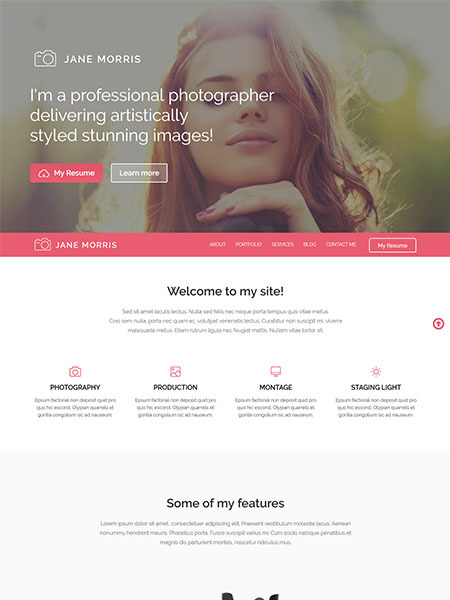 TemplateMonster’s Jane Morris is a free and fully responsive photographer portfolio theme for WordPress. The theme leverages big imagery and a clean, minimalist design to deliver artistically styled, stunning images to your site’s viewership. The theme comes packed with everything you could possibly need to build a captivating portfolio for your photography business or anything else that’s image intensive. Built on the Cherry Framework, Jane Morris offers a ton of customization options to webmasters who’d like to spice up their site’s design with bright colors and bold typography. Being an image-intensive theme, Jane Morris features lazy image loading effects to enhance the viewer’s browsing experience. On top of all of these great features, the free Jane Morris theme is translation ready from the get-go and allows webmasters to reach out to a global audience easily. 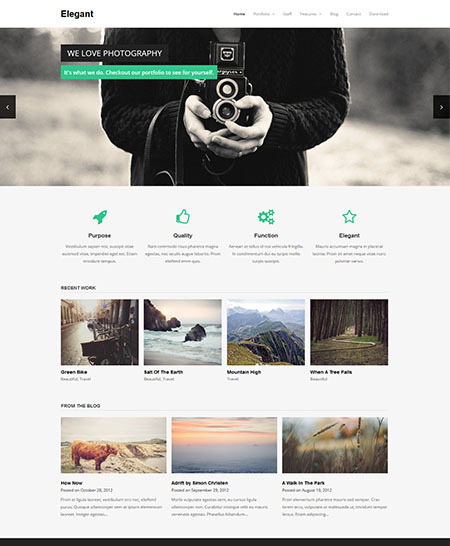 Complete with parallax scrolling, this one of a kind theme is a great free alternative to premium photography themes. 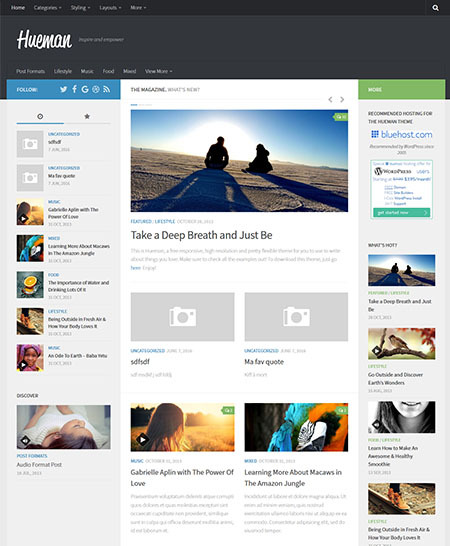 That aside, I would like to mention that there are many more free WordPress themes out there. As such, we might have missed your favorite theme. Just share your best free WordPress theme in the comments and let’s advance this post (and WordPress in general) one theme at a time. Do you know if de Activello, is HTML5? Yes — it uses HTML5. Thank you Freddy ffor making up a detailed and indepth list. It’s really a help to this first time wordpress user who has a particular look in mind and no actual starting reference for some of the better themes. I like clean and elegant content display with room for a gorgeous photo in each blog post, Activello is looking like one of the strong contenders. Glad you found this post useful — thanks for sharing your insights. Most of the themes mentioned here are top WordPress themes. I enjoyed reading the post. No problem — glad I could be of help. Shapely sounds like a nice theme — will check it out, thanks for the suggestion. If I need a contact form with dropdown options(choice of fields before responding) for response and also browsing facility for attachment over it. Which theme should I go for ? Thanks for sharing this awesome collection. Hi, just downloaded Parrallax 1 and it won’t install correctly, keep getting a page of these and an error cannot connect to database………… Can you suggest a reason? Is it compatible with latest WP? Hi – Thanks for sharing this! Do you have any recommendations for creating a site for music festivals?